One of the seashells donated to a maritime museum in Turkey's southwestern resort town of Bodrum by a businessman has turned out to be a fossil with 460 million years of history, reports revealed Friday. Hasan Güleşçi, who had been collecting seashells for some 40 years from a total of 130 countries he visited, gave away his collection consisting of 7,000 pieces to the Bodrum Maritime Museum six years ago for an exhibition. However, it was just until this year that a group of researchers noticed that some of the seashells in Güleşçi's collection had much more to offer, especially for the field of paleontology, since they had a history dating back to millions of years ago. 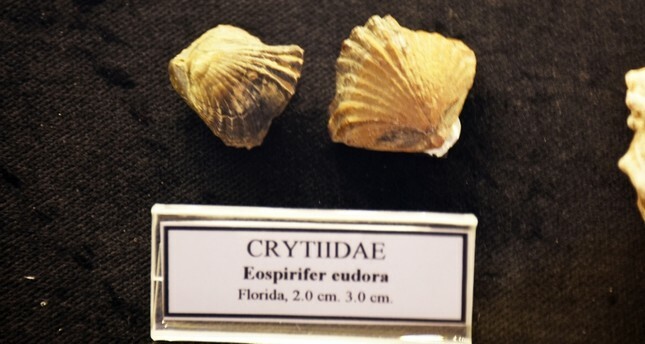 The fossil has been identified as an eospirifer eudora from the crytiidae family — or in other words its the seashell of a brachiopod which is a clam-like animal — and is thought to be from the Paleozoic Era. The museum said the shell was found in Florida, the U.S. The group led by Serdar Mayda, a paleontologist from Ege University's Biology Department, will conduct a more detailed examination after revealing that 46 of the seashells in the collection were fossils ranging from a million to as much as 460 million years old.